On March 14th 2016, scholars, designers and artists from around the globe will convene in Abu Dhabi for Charisma of the Book: Global Perspectives for the 21st Century, a 3-day workshop sponsored by the NYU Abu Dhabi Institute. 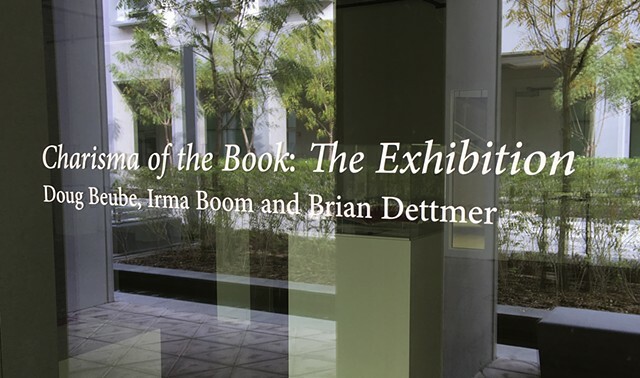 Participants will include book designer Irma Boom, and artists Doug Beube and Brian Dettmer. To mark the occasion, the NYUAD Art Gallery and the NYUAD Institute are pleased to present works by these artists in Charisma of the Book: The Exhibition. Beube and Dettmer create artworks through a transformation of often used or discarded books. At turns these sculptural works isolate, alter, expand and repurpose elements of the source material, but the works engagement with the idea of the book transcends the mere fact of their composition. Dettmer often begins his practice by sealing a book with varnish, then carving away page by page: a process which invokes both reading and metamorphosis. Beube categorizes his bookworks into three divisions by action: cut, fold, gouge. Dettmers works often surprise through what they reveal of a book; Beubes are just as likely to invoke absence, elision and obscurity. In surveying Beube and Dettmers works, and reckoning with the process behind their creation, one is confronted from new angles by the same issues which continue to inform the study of the book: questions of authorship and readership, object aesthetics, means of production, and the power structures embedded in information systems. Finally, work by book designer and editor Irma Boom allows visitors to explore the nature of the printed book itself. Visitors to the exhibition will have the opportunity to handle several editions from Booms oeuvre, innovative and engaging works which reflect the ever-evolving role of the book in the age of digital dissemination of information. For Boom, in the face of an allegedly growing popular preference for web-based information, bookmaking is an opportunity to reaffirm the value of the book through conscious and effective design. A books design and construction have the capacity to augment, reinforce or enhance the impact of its contents; Boom highlights that symbiosis, and makes a case for what she has called the Renaissance of the Book.